HER work has been displayed from Calgary to California, and hangs on walls as far away as New Zealand, but applauded artist Darlene Adams still calls Edmonton home, and continues to thrive as part of our bustling arts community. In fact, Adams was born right here in Edmonton, graduating from the Victoria School of Performing & Visual Arts with a Commerical Arts Degree, before taking some time off to travel the globe. In '02 Adams picked up where she left off and delved into her artwork, dabbling in sculpture, but focusing her attention on oil paintings. "Although I've tried various mediums, I love the deep hues of oils," Adams told I Heart Edmonton. "I love bright and bold colours, and I'm inspired by what I see around me." Pictured below are two of Adams' lively oil paintings, "Hope Valley" (left) and "Crazy Rapids" (right). "I painted this with the great feeling I get when I visit California," Adams said of the former. 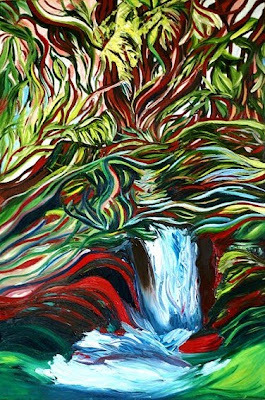 "In this painting I felt the trees come to life on the canvas, with the roots and the valley becoming one." That same passion was applied for "Crazy Rapids" as well, influenced by a trip to B.C. 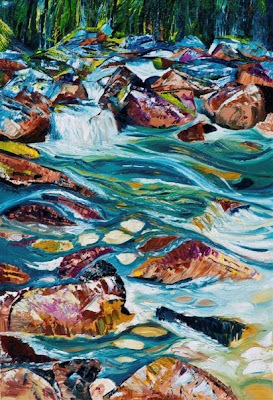 "I took the feel of the rushing water, painted into an [abundance] of movement, then textured the rocks to give a very bold look to them," Adams continued. Adams, who cites the timeless Vincent Van Gogh as her primary inspiration, now inspires others through her own work. She currently serves as a member of the Edmonton Arts Council, and involves herself in Artwalk Artists, Artscapes Canada, and the Canadian Artists for the Poor. Oh, and she's a mom, too! If you'd like to purchase or check out any of Adams' stunning pieces in person, then head down to the Mandolin Bookstore & Coffee Company (6419-112 Ave.) any time until the end of December, or you can even make an appointment (dartwerks@yahoo.ca) at Adams' personal residence. If it's too cold outside for your liking, then check out Citytv's Breakfast Television on Tuesday (December 22nd) when Adams and her "Artwerk" will be profiled on air, between 8:30 & 10:00AM. Artwork posted with permission from artist. Both of those paintings are very vivid and grab my attention at first, not entirely sure what to make of them once I take a good look though. Maybe I will have to check out some other paintings because I really do like the way the "pop" and seperate themselves. I've seen many of Adams' pieces and they're all amazing. It was very difficult to choose which ones to showcase here, but we finally agreed on these two (there were too many beauties to choose just one). I'm going to make sure that I check out the artwork in person at the Mandolin, but I think I'll wait until it warms up a wee bit. Darlene is marvelous artist who paints from her soul. She instills life and energy onto the canvas and leaves us with an experience. These pieces are simply stunning. I love how she was able capture our attention with the colours and use of her own style, not your typical landscape paintings. Stunning. I'm looking forward to seeing Darlene on TV! She'll be profiled on Citytv's Breakfast Television (6-10AM) this Friday (Dec. 18). Even took the day off work to see her! Seen Darlene's work at art walk this year, and it was amazing. Great work Darlene.